Trade shows offer a great opportunity for businesses to make their mark on attendees. They can be used to raise awareness or to springboard a business into profitability. Success is largely determined by how memorable, useful, or effective your promotional products are in communicating a message that resonates. We’ll let you decide whether this list of the Top 15 Bizarre, Unique, and Hilarious Trade Show Items were successful experiments. But one thing’s for sure: once you see them, they’re hard to forget! Snuggie made the rounds to trade shows with their Wuggie variation in 2009. 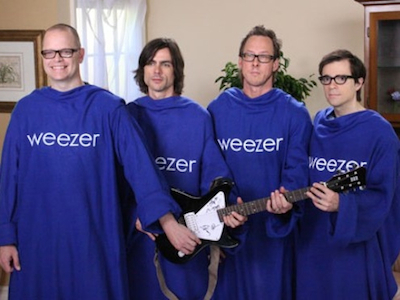 Weezer frontman Rivers Cuomo describes the product best as “pretty much just like a Snuggie, except it has ‘Weezer’ on the front. '” According to Pitchfork, the phenomena didn’t stop with promotional events. It extended to the realms of television, turning up in a cult classic infomercial. 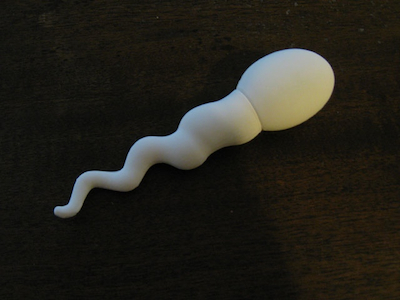 This little gem comes from the American Society For Reproductive Medicine’s (ASRM) 2008 conference. It was given out to all in attendance and acknowledged as some of the best trade show swag ever by Gizmodo. While it may seem a bit odd to see this hanging out of the drive on your computer, it was really a unique and brilliant keepsake that kept perfectly in line with the purpose of the conference. The recently completed Dexter television program sliced its way into the hearts of TV viewers all over the world during its eight-year run. 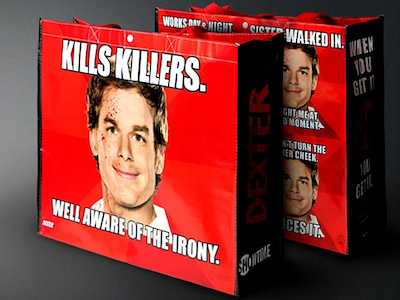 To commemorate the penultimate season, broadcast partner Showtime commissioned these drily humorous swag bags that perfectly matched the tone and wit of the series. They made their first and only appearance at San Diego Comic-Con in 2012. 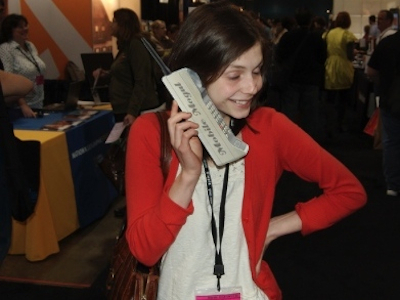 Unfortunately, we couldn’t find the 411 on this design conference attended by Flickr user Alex Braidwood, but we were able to get a glimpse of the Zack Morris phone handed out by Mobile Mogul during the event. In an environment dominated by stress balls and thumb drives, this is definitely one that stands out from the pack, and if you ever let Saved by the Bell get its hooks in to you, then you can appreciate the nostalgic aspects. 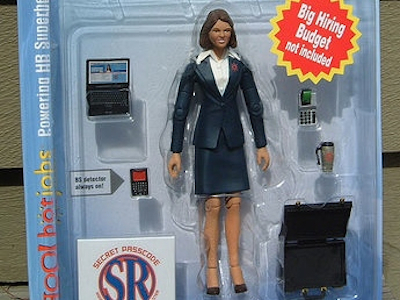 A quality recruiter takes a lot of action and can be downright heroic to a business, so it’s only fitting that at the 2005 SHRM show, you could procure an action figure paying homage to this valuable team member. Flickr user Dr Nik was able to grab a snapshot of it, front and back. 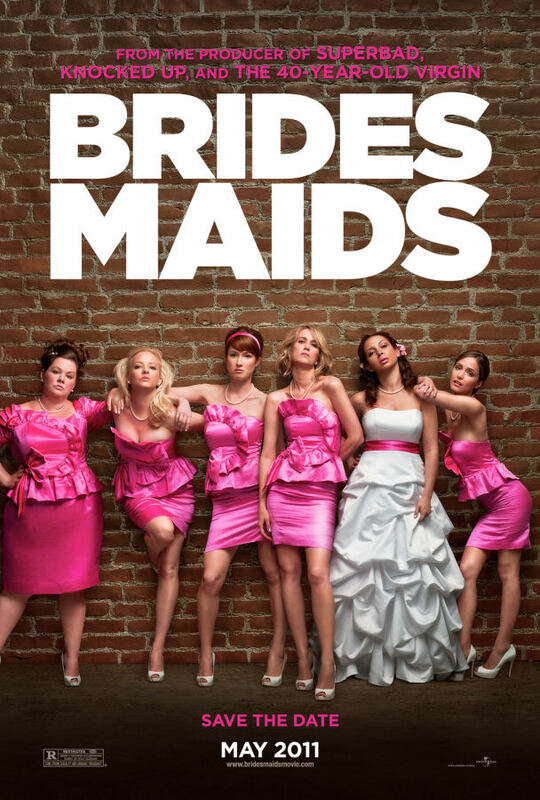 From the looks of things, this comes without a big hiring budget. You’ll have to buy that separately. 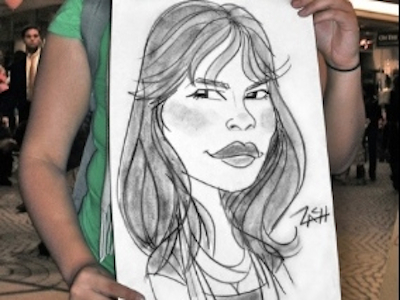 Caricatures by Zach has played numerous trade shows throughout the San Francisco area. Pictured here are two of many unique creations that attendees enjoyed during an event in 2010. This is one rare case where the promotional item is more of a service. Companies and events can hire Zach Trenholm to draw attention to their booth. Each sketch takes between three and four minutes to complete. The Hapifork caught the attention of sites like Cult of Mac when it debuted at the Consumer Electronics Show (CES) in 2013. The eating utensil’s specialty is that it can tell you how fast you’re devouring food and vibrate when you’re going too fast. 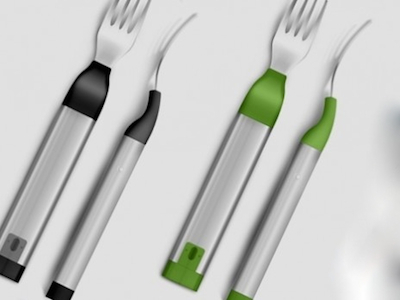 By reminding people to chew their dinner instead of inhaling it, the Hapifork improves the chances that users will pull all the nutrients from their plate, and it allows everyone to track results over a period of time by connecting to a computer through the USB port and transferring data to the hard drive. The site Grand-Illusions.com showcased a trade show variant of the wooden block clock on a recent YouTube video. Unfortunately, they did not give the name of the company or exact event, only the fact that the device was procured at a trade show. We were able to track down a similar product from the team at the British company Ging-ko. 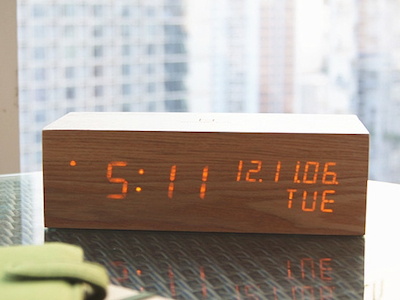 The gist of it is this: Each side appears as if it is a clean sheet of wood, except that the front panel expertly hides an LED display that produces time, weather, and other data, whenever you tap it or whenever it’s time for the alarm. Slick! This little gem made its grand appearance at the World Toilet Expo (year unknown) and attracted the attention of major news organizations like the Toronto Sun for its sense of humor and surprising degree of functionality. At first glance, it’s a bit of a crass office joke, but it certainly does a great job of holding paper clips, staples, and other office supplies. In the 1958 sci-fi classic The Blob, a gelatinous alien life form crashed to earth and commenced eating everything in its path. With each meal, it grew bigger and bigger until it had graduated from a mere ooze to the terrifying, blood-red substance that threatened an entire town. That town was Phoenixville, Pennsylvania, and for more than half a century, the actual citizens (not the movie citizens) have celebrated their claim to fame with Blobfest. 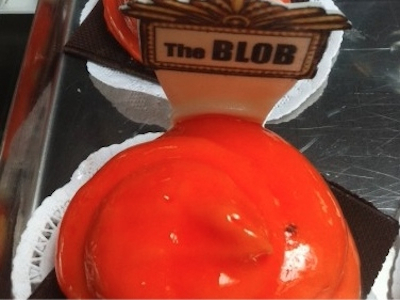 In 2011, the Artisans Gallery and Cafe got in on the mix with a raved-about Blob dessert, which consisted of white chocolate Cointreau mousse packed with summer berry filling and vanilla sponge cake. If you’re going to debut a product that promises to “capture the Sacred ways” that also “intensifies your Focus and deepens your Connection to the realm of Magic,” then what better place to get the job done than the Annual Psychic Fair and Witchcraft Expo? Divinely Charmed Essence did just that at the 2013 event. We’ve included it here for the unique quality in the things that it promises for a $60 price tag. It reportedly “creates a sense of balance and pure intent” and “opens connection to fly between worlds,” though we’re not entirely sure how. The National Coffin Exhibition is probably one of those trade shows you weren’t aware existed (unless you’re a mortician, of course). 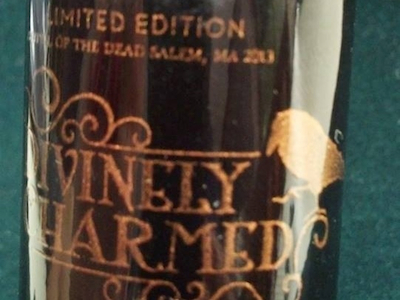 Not only does it exist, but it also features some of the most bizarre and unique creations ever crafted. 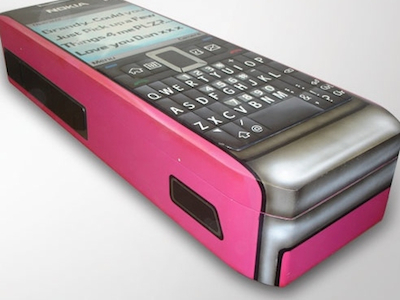 One such offering is this smartphone coffin from the crew at Crazy Coffins in the UK. While Crazy Coffins admits that they don’t sell very many of their specialty creations, they do enough business to be a mainstay at NCE. While we couldn’t ever see ourselves being buried inside of a Nokia, we are glad that the option exists for the more eccentric among you. 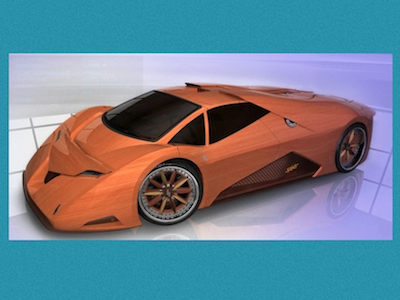 Expert woodworker Joe Harmon has built the Splinter Vision supercar out of nothing but wood and automotive parts. (Yes, it is a functioning car with engine and everything.) We’re not sure how well it runs, but it’s certainly a beauty, and it extends the already useful functionality of wood materials from the home to the driveway. It made its grand debut at the International Woodworking Fair of 2008. This one may not be hilarious, but it’s certainly one-of-a-kind. And here we end on a humorous note with a box of pencils procured from an unknown educational conference in 1998. 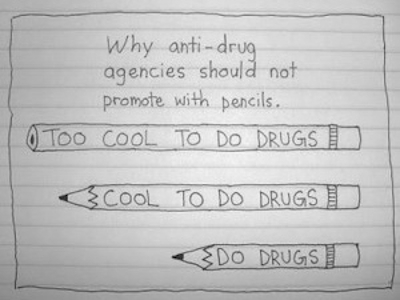 The Ticonderoga Elementary School in Plainview, New York, had nothing but the best of intentions when they purchased dozens of pencils with an anti-drug message for their youth to enjoy. Unfortunately, according to the New York Times, it took 10-year-old Kodi Mosier to realize that the pencils weren’t so anti-drug the longer they were used. 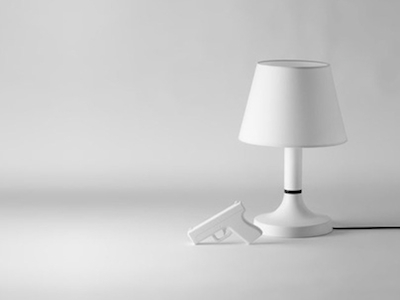 The message – “Too Cool To Do Drugs” – was situated in a way that whittled away each time it was sharpened until, finally, children were left with the messages, “Cool To Do Drugs” and then “Do Drugs.” It’s been an Internet meme ever since. Here at Discount Displays we have years of trade show experience but even we were stunned by some of these products. Which of these trade show items did you find to be the most unforgettable? Share your picks in our comments section, and if you have any inclusions that should have made the list, please share! This list really does cover the best of the best in trade show swag, from hilarious to “OMG I want that”. Which is what I said about the alarm clock that appears to be just a strangely comforting glowing block of wood. It’s so functional, but gives you that “unplugged” feeling at the end of a hard day at the computer. Sweet. That being said, the toilet expo desk organizer and the swimmy USB drive are incredibly creative and daring. That’s what you have to be to get people’s attention in a crowded marketplace! Fantastic article. Clearly when you sell trade show display items it can be hard to write up quality, engaging content on a regular basis. However, you’ve nailed it with this piece. It just goes to show that regardless of the topic, there is a way to present something that can be both entertaining and informative at the same. Well done! The Website for the wooden clock was in the description of the Grand Illusions video. Haha. I didn’t know which bizarre trade show item I liked the best but they were all great. I think that the wooden block clock was my favorite. Great Trade Show gimmicks.